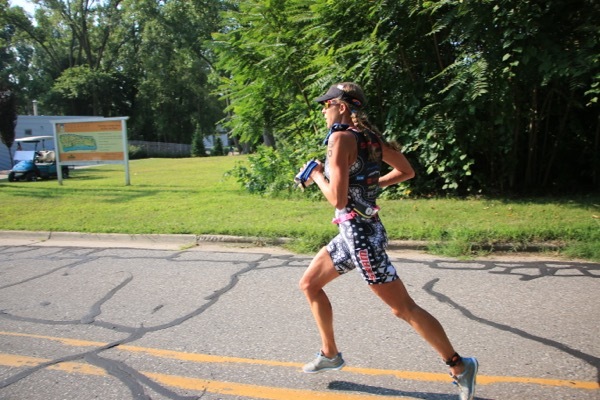 This past Sunday, I raced in Benton Harbor, Michigan. On Friday, Nate and I drove six and a half hours and arrived around 6pm. Surprisingly, Benton Harbor is just past the time zone change, so we were in the EST (which made for a 3:15AM wake up CST race morning~). On Friday we drove straight to race site and did a very short swim. I wanted to shake out after the drive and check out where the race was located. 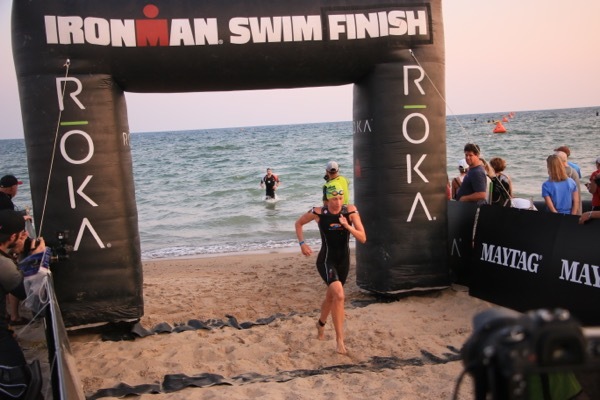 The swim was located in a beautiful park in Lake Michigan. The water was surprisingly warm and it felt great to get in and enjoy the clear, beautiful water. After the swim we went to an Italian restaurant and enjoyed a sit down meal (a rare occasion for us these days). We wanted to bring the kids this trip since it was within driving distance, but Caroline had kindergarten orientation Friday evening and I didn’t want her to miss that. She begins Kindergarten on Tuesday! We made the error of booking our hotel reservations too late and thankfully found the last hotel room open in the area at the America’s Value Inn. Minus the think cloud of cigarette smoke in the halls (despite no smoking signs everywhere) and a leaking ceiling over the vanity, it worked out great. 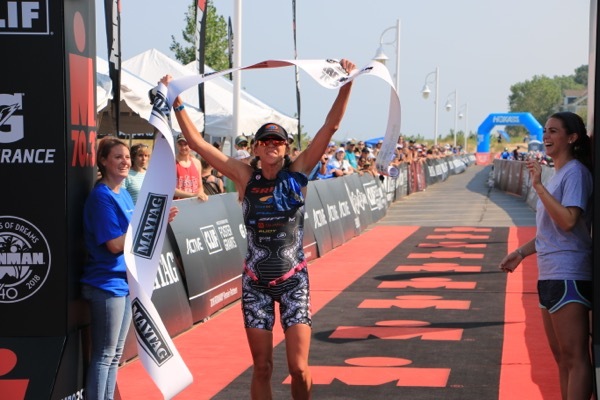 The last 70.3 I raced was in March of 2016, so it has been nearly two and a half years! I woke up around 4:15AM and started hydrating and getting in breakfest. I had all my gear packed the night before, minus filling up my bottles. I noticed my aero bottle had a leak in it that was going to carry my race nutrition (mix of gel and water). We tried taping it, but that didn’t work. We tried gum, that didn’t work! So I decided to fill a gel flask and put it down my suit before I got on the bike. Fortunately, plan B worked just fine. I felt a little out of sorts pre-race as I knew that I didn’t want to do too much warm-up before a long day. I racked my bike and jogged for just a couple minutes and did a few strides. I headed to swim start and did a short five minute warmup. The water was very choppy and had a strong current. 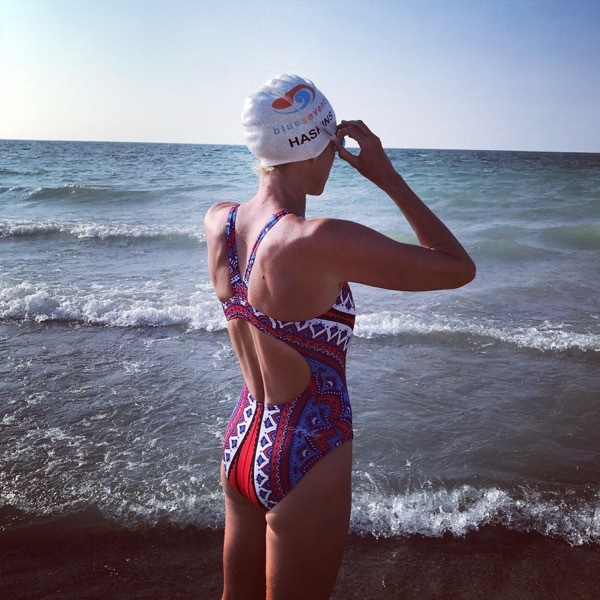 The swim was also a beach start, so I wanted to attempt not to fall on my face again like I did earlier in the year in California! I took the start a little more chill on the run in and began swimming after 20 meters. 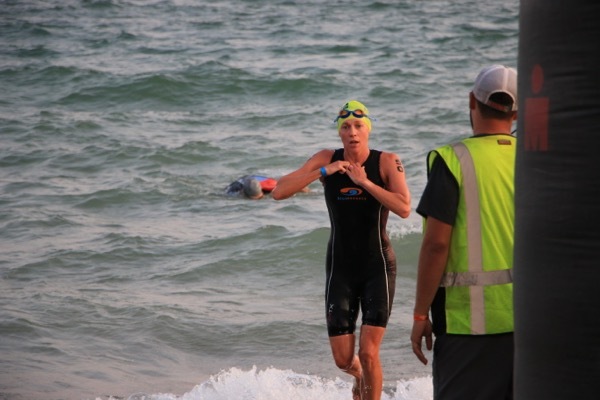 I took the lead by the first buoy and the remainder of the swim. I worked on sighting and breathing at the correct timing of the wave so that I would not swallow water! I felt good in the water although it was hard to get into any sort of rhythm due to the waves and chop in the water. I used my Blueseventy PZ4TX swim skin with the Blueseventy Element Goggels. 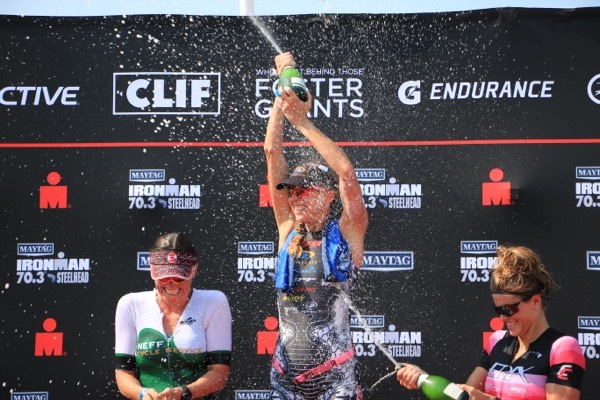 Behind every win is lots of hard work, training and organizing workouts weeks and months prior. Special thanks to my family for helping me with all the training and organizing. One of my favorite parts of this race was hanging out at the beach afterwards. 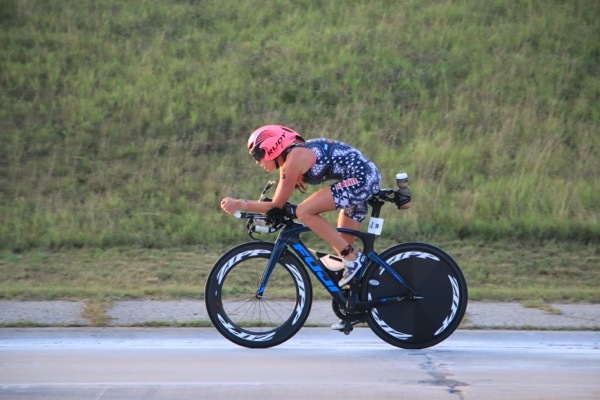 I met many different athletes from all over the midwest and it was fun to hear their stories of how they got into the sport and share race day experiences.